Living Free Animal Sanctuary was founded in 1980 as one of the first privately funded, no-kill animal sanctuaries in the country. We rescue cats and dogs facing imminent shelter euthanasia, then find loving homes for them. Once they are transported here, they're quarantined, given a complete veterinarian's exam, vaccinated, and then spayed or neutered, if needed. No animal is caged at the Sanctuary. Our cats live in open catteries with access to protected outdoor play areas where they can enjoy fresh air and sunshine. Our dogs live in specially designed kennels-in-the-round that open up into large play yards. Give Life Park is an enclosed acre of land where the dogs can run, train, socialize and just be dogs. Our goal is to find every animal a family and a loving home, but if they are not adopted, they are free to live out their lives here with us. Living Free Sanctuary will accept only volunteers that have been verified by Doobert. Living Free Sanctuary will not make a donation to the organization that the dog/cat is being transferred to. Living Free Sanctuary requests that any carriers belonging to Living Free used for the purpose of transporting the dog/cat be returned to Living Free Sanctuary once the transport is completed. 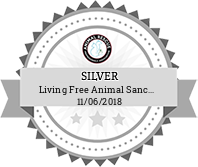 Living Free Sanctuary requests that the receiving organization of the dog/cat, submit a follow-up report to Living Free Sanctuary verifying the safe arrival of the dog/cat to their organization. In the event, that the dog/cat given to an organization and is adopted out by them and then returned to that organization and they are unable to take the dog/cat back, Living Free Sanctuary would request that the dog/cat be returned to Living Free Animal Sanctuary.